Glens Falls NY - Silly Bands Sightings, Where To Get Them? Silly Band Sightings - Where to get 'em?! If you have a school aged child most likely they've come home with a colored rubber band around their wrists. What are they, you ask? 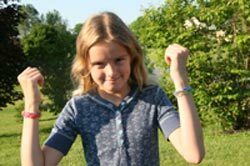 They are the new fad kids are going nuts over: Silly Bands! We called Rite Aid yesterday to try to get our hands on some. As it turned out, they had just opened a carton of them... but guess what? This morning they are all sold out. In just one day! We just heard from Dog Ate My Homework in downtown Glens Falls. They have Silly Bands in stock! Give them a call at 792-0133 for more information. Silly Bands can't keep up with the orders and new stores can't get them. We have heard from Hallmark in Aviation Mall that they will get them in "early June." We will post where we see them here and try to keep you up-to-date as to where you and your kids can find them! Note to parents: While most fads can be annoying and costly, this fad has a "teachable" moment in it. Kids are being given these bands by others, sharing is rampant as is trading. At 25 cents per band, it can be an inexpensive way to help your kids learn to share! 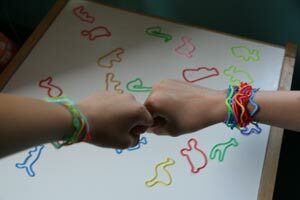 GlensFalls.com: Why do you like Silly Bands? Julia Mannix: Because they are fun to trade, and they're cool cause they're shaped like animals, cars, dinosaurs and everything. GF.com: What is your favorite Silly Band shape? GF.com: How many kids in your class have these Silly Bands? JM: About 70% of the kids. GF.com: How long do you think this fad will last? JM: At least a year. Once everyone has them they won't be popular anymore. Even my science teacher Mr. Henderson has a couple. GF.com: Where have you heard you can find them? GF.com: Where have they been sold out? GF.com: Have you heard of Goofy Bands? JM: Yes, they're almost the same just different names. GF.com: Would you wear them? GlensFalls.com just confirmed that as of Wed. May 26th, Blockbuster Video on Broad St. has about 30 packets of Silly Bands - $2.99 for a packet of 12!